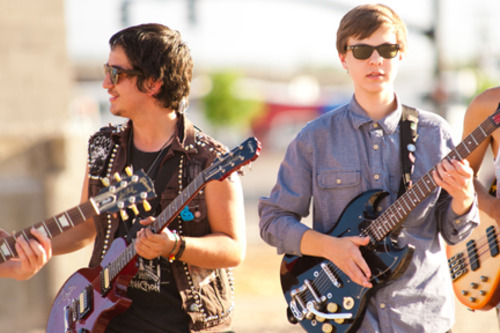 Two teenagers from Spy Hop&apos;s year-long after-school music program have won first place in the GRAMMY Foundation and MusiCares " Teens! Make Music Contest" for their interpretation of the dangers and impact of drug and alcohol use. Vinny Cavalcanti (18, West High School) and Nick Miller (16, Rowland Hall) have won backstage passes to the GRAMMY awards rehearsal on Friday, February 8, an iPad, a cash prize and an opportunity to release their song with Clarity Way Records. This nationwide contest is a collaboration with The Partnership at Drugfree.org and a part of National Drug Facts Week.The duo were a part of the Spy Hop band Mystique, and wrote the song, "Psychological Cool Guy," for their debut album "Which Boots, Witch Boots". The song depicts how an individual can succumb to drug and alcohol addiction and reveals the deep concern friends have for his unhealthy lifestyle as illustrated in the lyrics, "I&apos;ve been meaning to talk to you about something for a while, about your problems with the syrup, and your problem with denial." Jeremy Chatelain, Spy Hop&apos;s Musical Arts Instructor said, "One of the goals of Musicology is to push students to think about what they&apos;re writing and what the message is. They usually begin the year with no idea that they can write conscientious, thoughtful songs." "This program provides an exceptional opportunity to showcase the combined work of the GRAMMY Foundation, MusiCares, and The Partnership at Drugfree.org, and it provides a unique opportunity for teens to share their perspectives on the issues of addiction," said Neil Portnow, President/CEO of The Recording Academy, the GRAMMY Foundation, and MusiCares.This is the second national award for the band; they also won first place from Adobe Youth Voices, the philanthropy initiative of the Adobe Foundation.